Tupras (T Petr Raf) is part of Oil and Gas Producers business, which is part of Oil and Gas industry. Tupras (T Petr Raf) is a company from Turkey, and his stocks are publicly traded. Tupras (T Petr Raf) paid a total dividend of 3,403 million TRY last year, for a market value of 29,175 millions (Market Cap 14,317 millions). Dividend per share of Tupras (T Petr Raf) is 13.61 TRY, and his stock market price 116.70 TRY. 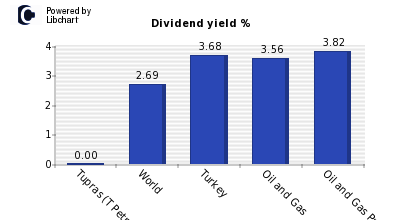 According to the chart below, where dividend yield is displayed, Tupras (T Petr Raf) has a dividend yield of 11.66%, which is higher than the amount offered by both the market average and companies from Turkey. It is also bigger than average of Oil and Gas industry. This high dividend yield might be a sign to worry about the future of the company so deeper analysis is needed. In addition, you should compare Tupras (T Petr Raf) dividend yield with other Oil and Gas Producers companies or firms from Turkey. About the ability of Tupras (T Petr Raf) to maintain his current dividend of TRY 13.61 per share, an amount that accounts for 11.66%, we should study its payout ratio both on earnings and on cash-flows (see chart below). Tupras (T Petr Raf) payout on ernings is currently 88.61%, which is higher than the market average, and companies of Oil and Gas industry, which are 40.41% and 45.26% respectively. Both figures show that Tupras (T Petr Raf) can have problems to keep with his present dividend yield. The payout on earnings should be complemented with the payout on cash flow since it is this last amount the one which can be distributed to shareholders. Cash flow per share of Tupras (T Petr Raf) is TRY 11.44 per share, which is lower than the dividend per share paid by the company of TRY 13.61, so the company does not generate enough cash to maintain his dividend in the future. The following figure shows payout ratios over earnings and cashflow of Tupras (T Petr Raf), compared againt world market average, Turkey companies, Oil and Gas industry and Oil and Gas Producers sector companies. Finally, last moth Tupras (T Petr Raf) showed a return of -6.60% compared to a worldwide -5.60% average, and a -8.37% of Oil and Gas firms. Over the last year, the company obtained a -4.00% versus a worldwide performance of a -11.41%. More detailed information can be seen in the following graph for Turkey and Oil and Gas Producers firms. Turk Hava Yollari. Turkey. Consumer Services. Turk Traktor Ve Zira. Turkey. Industrials. Turkcell Iletisim Hi. Turkey. Telecommunications. Turkiye Halk Bankasi. Turkey. Financials. Turkiye Is Bankasi C. Turkey. Financials. Tullow Oil. UK. Oil and Gas. TUI AG. UK. Consumer Services. Tsuruha Holdings. Japan. Consumer Services. Tsumura & Co. Japan. Health Care. Tsogo Sun Holdings. South Africa. Consumer Services. Tsingtao Brewery H. China. Consumer Goods.